George Mason College Library, Fairfax, Virginia, 1967. George Mason University Libraries records, R0095, Box 194, Folder 5, Special Collections Research Center, George Mason University Libraries. What was once considered old has become new again! 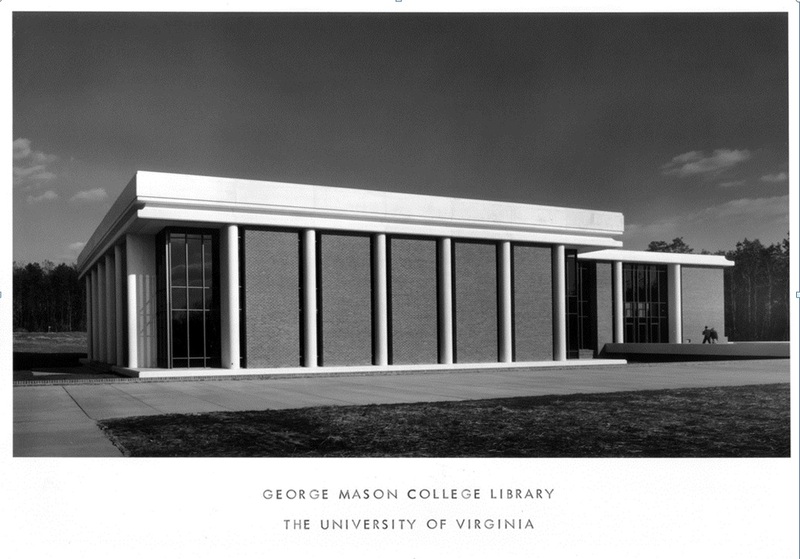 1966 architect’s rendering of George Mason College Library, Fairfax, Virginia. George Mason University Libraries records, R0095, Box 139, Folder 6, Special Collections Research Center, George Mason University Libraries. During the fall of 1967, George Mason College of the University of Virginia opened its fifth building on the Fairfax Campus. The original four – North (now Finley), South (now Krug), East and West – went into service in August of 1964. A significant part of West Building served as the college library until the completion of the 14,000 square-foot two-story library in 1967. During the building’s dedication in December, it was named for a local member of the state legislature, Senator Charles Rogers Fenwick. Fenwick, a speaker at the event, was unaware of the naming plan until it was announced at the ceremony itself. He was admittedly surprised and humbled by the gesture. 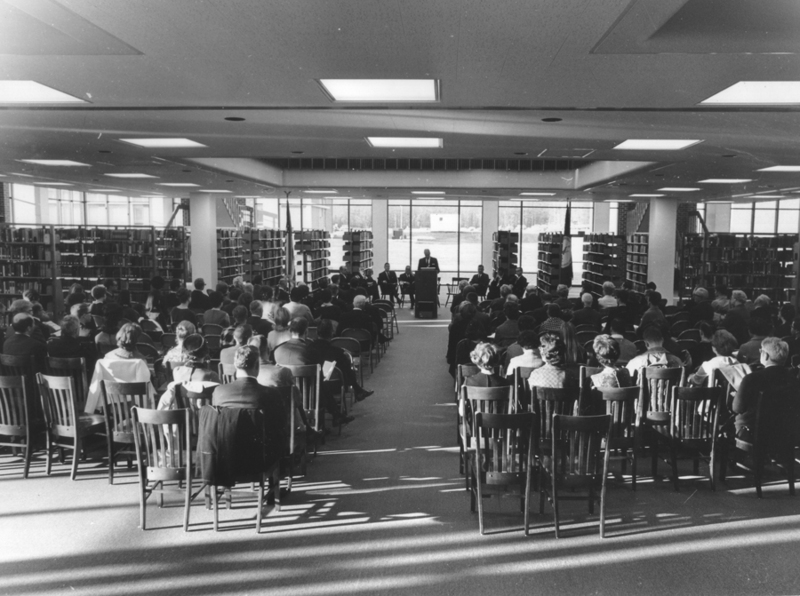 George Mason College Library Dedication ceremony, December 15, 1967. This space served as the Periodicals/Microforms and Reading Room from 1967 until December 2015. George Mason University photograph collection, R0120, Box 1, Folder 29, Special Collections Research Center, George Mason University Libraries. As Mason became an independent university, and enrollment tripled over the next sixteen years, Fenwick would undergo two major additions. A tower was added to the southwest part of the building in 1974, and an identical one on the southeast side in 1983. By the end of the 1980s, administrators agreed that the university’s needs were growing faster than the library. 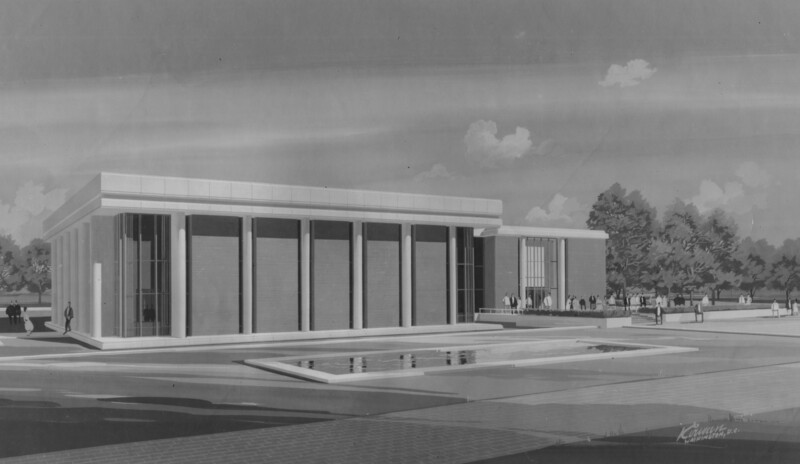 Plans for more additions to the library were drawn up but shelved to make budget room for the upcoming University Learning Center (known today as the Johnson Center). By the early 2000s library administration and staff were planning again for a new addition to Fenwick that would add more space for study, programming, and housing of staff and library resources. By 2013 ground was broken, and construction was underway. The new Fenwick Library would take over two years to construct and add over 2,000 seats for study, a 24-hour café and study space, a state-of-the-art Special Collections Research Center with dedicated space for exhibitions, and dedicated areas that can be used for special library events. The 150,000-square foot addition was completed in January 2016 and complies with LEED silver standards. So, what happened to the original library space? Interior of The MIX@Fenwick, July 2017. This is the same location as the 1967 photograph above. Photo by Emily Curley. It has been transformed into the MIX@Fenwick. 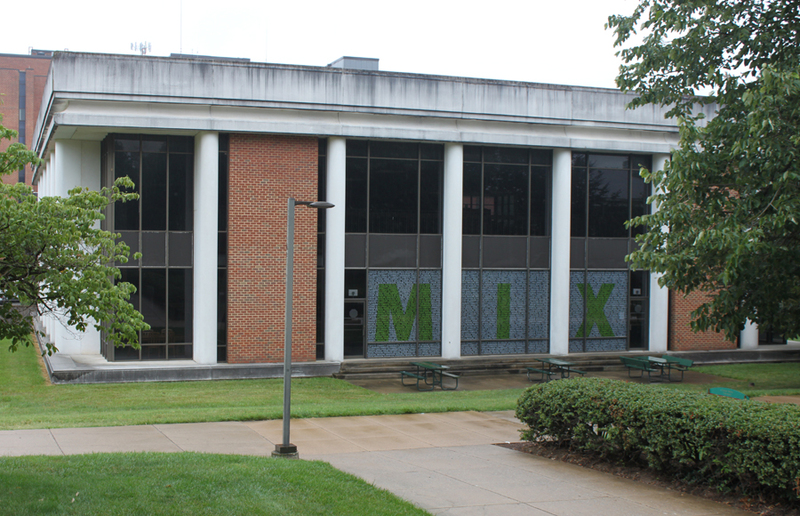 The MIX network (Mason Innovation Exchange) consists of two on-campus entrepreneurship- focused collaboration and maker spaces. The MIX@Fenwick is a student-centered collaboration and event space that will promote and encourage entrepreneurship at Mason. It opened its doors to the Mason community in June 2017. 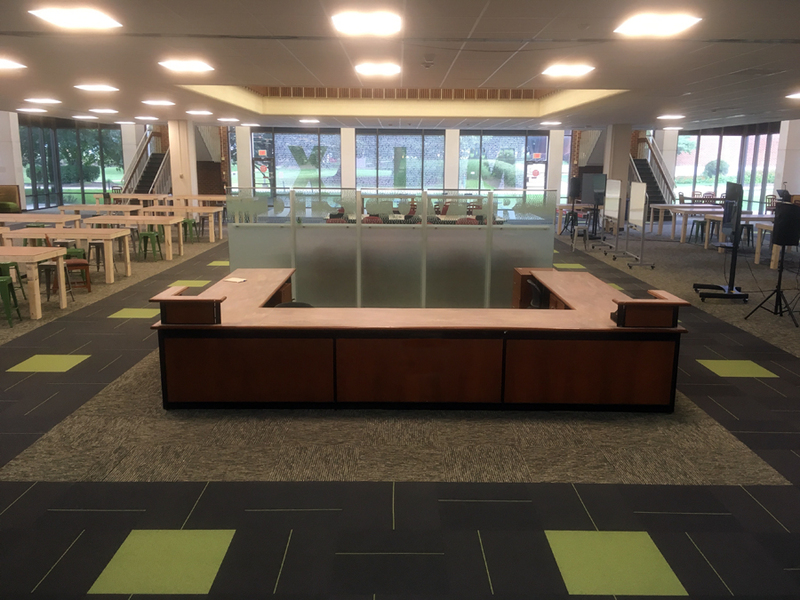 MIX@Fenwick provides students, faculty, and staff with spaces and tools for co-working, collaboration, and experiential learning. Multi-disciplinary groups can come together to meet, develop ideas, research problems, craft solutions, and start companies. The MIX@Fenwick is intended to be a place to promote interactions among students, faculty, staff, alumni, investors, and business advisors. The Mason Innovation Exchange network seeks to empower students with the tools to solve problems and pursue entrepreneurial opportunities; provide a place to meet, socialize, and collaborate; create a network of entrepreneurial-minded individuals; and create a start-up culture at Mason. For fifty years Fenwick Library has been an anchor building on the Fairfax Campus, bringing together students, faculty, and staff. Now that the original has been replaced, it is gratifying to see the former space repurposed and used once again as place for collaboration. Exterior of the north side of the former Fenwick Library with MIX graphic on the window. Photo by the author.